This is a wonderful diorama of a sailing regatta outside Laboe, Germany. The Laboe Naval Memorial is a memorial in Laboe in the vicinity of Kiel in Schleswig-Holstein, Germany. Completed in 1936, the monument originally memorialized the World War I war dead of the Imperial German Navy. Since the end of World War II, however, it commemorates sailors of all nationalities who died during the World Wars. The monument consists of an 85 meter high tower resembling either the stem of a Viking ship or the conning tower of a submarine, a hall of remembrance, and an observation deck. This 3-Liter Asbach bottle is 19 inches by 4 ½ inches and it consists of 3 beautiful sailing ships, 2 under full sail, on greenish-blue water with whitecaps outside an interesting coast. The first ship is the “PREUSSEN," the second is a Brigantine from the 1900's, and the third is the "Constitution" from the 18th century. On land are 14 houses, a windmill, and the naval monument of Laboe. There is a large lighthouse with two levels of railing. There is also a waterfall depicted with two sea shells. At the top of the falls is a colorful bird. Another bird is perched atop the mast of the Preussen. In the center of the bottle and the town is a large cross with Jesus. Under the bottle are three labels with the names of the three ships. There is another label with the name and address of the builder of this diorama. The label reads: "1979 Hans Maier, Badgasse 21, 8711 Mainbernheim." The bottle is sealed with a cork and red sealing wax joining the rope around the bottle's neck. The bottle rests on a wooden stand. 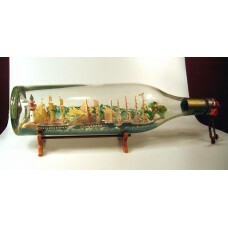 This great diorama will make a beautiful mantel piece or on that special display in your home or office.